Another California Republican Party convention has come and gone, and many are asking, “Why bother?” given that “The outcome of the convention changed the nature of how the party operates and further consolidated power among a very few while continuing support of the terrible Top 2 voting system,” as Tom Del Beccaro, former CA GOP Party Chairman says. I went to the convention Friday immediately following the second California State Senate committee hearing in two weeks on ‘hate speech,’ with Democrats seeking approval for legislation on thought crimes (article coming on that). So my tolerance level for BS, and Republican moderates’ pablum wasn’t very high. (pablum: trite, naive, or simplistic ideas or writings; intellectual pap). One of the first things I was hit with, even as my co-author James Lacy and I were setting up our booth to sell our new book, “California’s War Against Donald Trump: Who Wins? Who Loses?” was whining by some about President Donald Trump’s Tweets. The White House occupant of the last eight years wasn’t exactly “Presidential” by many definitions. And yet, these same people complaining about Donald Trump’s Tweets were silent during those eight years. Trump’s Tweets are good for America, and provide access and insight to the presidency. If you don’t like them, then don’t read them. But I suspect that many of the people complaining aren’t even on Twitter. Which also brings me to George Bush. I covered the Steve Bannon dinner Friday night with the press. It was electric. The security was ‘Presidential’ level. And the predictable ugly group of misfit paid protestors were outside the hotel making noise and saying foul and incoherent things. Kudos to the Anaheim, CA police for keeping order while allowing the protests to take place. UC Berkeley should call you. “He has no earthly idea whether he’s coming or going, just like it was when he was president of the United States,” Bannon added. Stinging, but this accurate analysis brought approval and applause from the dinner attendees. Interestingly, on Friday the San Jose Mercury News asked why the California GOP invited Steve Bannon to speak… clearly the piece was click bait. “Why would the state’s GOP, which has been circling the drain in recent years with an anemic voter registration of under 26 percent, want to bring in such a polarizing figure to rally their worn-out troops?” The SJMN asked. Mayes only made it further evident why his ‘leadership’ was anything but, and he had to go. Mayes continues to sell-out his constituents and his Party to this day, making deals with the Democrats, just so he can keep his phony-baloney job. (Mel Brooks references are always apt). Really? 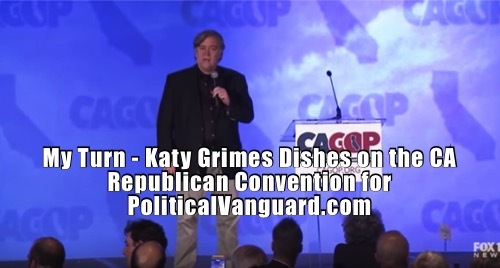 The sold out VIP reception and dinner Friday evening of more than 500 California Republicans would disagree. And they were just the ones who could get in. Many others couldn’t get tickets, but wanted to hear Bannon. I can appreciate weighing in on the usual media scandal and conspiracy of the day, but calling intelligent people “dumb as a bunch of rocks” is bush league, and nothing more than click bait. I hope it helped gain more like-minded Twitter followers. This is why I am tired of the whining about Donald Trump’s Tweets, usually from ineffective, or cowardly, or even irresolute people. I’m a doer, not a whiner. Steve Bannon was speaking to me, and to the thousands of other doers in California who are disgusted with the donor class, the whiner class, the turncoat Republicans in California, and Washington DC, and the consultant class, who have consistently propped up loser candidates. We are also done with the left destabilizing and destroying California. Bannon said it is time to win in Washington, D.C., but we need unity on the right. As one convention attendee told me, too many Republicans “are a bunch of spineless wussies unwilling to stand up to the corrupt liberals running our state and nation into the ground.” He wasn’t whining about Trump’s Tweets. Touché. I suspect ‘unity’ on the right is a melding of Conservative and Libertarian, with the RINO liberal wing being allowed the opportunity to join the LibProg left. Why did Brulte invite Bannon and then on Sunday he got his way by being paid and not supporting repeal of top 2. I have heard Brulte say personally he loves top 2 and that he is in the wealth building mode of his life and doesn’t have the answers to the dwindling party. He doesn’t have a Registration plan. How can you win elections without voters to vote for your candidates? Bannon is anti establishment and Brulte is pro establishment. Is he now getting 2 pay checks, 1 from the GOP and the other from democrats to destroy our party? He did get paid to support National Popular Vote, that is definitely one way to destroy our Party. Why is everyone so pro Brulte when I have not seen one thing he has done to build our Party? Fact is most he does destroys the Party.